Puppies are hardwired to chew on stuff from the moment they’re born. The urge becomes even stronger as they undergo the teething phase. While it may sound alarming, it’s actually a natural process. This doesn’t mean, however, that you just have to let your cute furry friend chew on almost any stuff you have. Not only can it ruin your things, but it can also pose some serious health risks especially if he happens to choke on small parts. Technically, any young dog that’s below 12 months is considered a puppy. However, you should know what specific stage your puppy is currently in. Even younger puppies have smaller mouths, which is why giving them smaller chew toys is ideal. Older puppies, on the other hand, will have larger mouths thus requiring chew toys that are appropriately sized for them. Another important thing to consider is your puppy’s chewing behavior. If your puppy is a heavy chewer, chances are his chew toys won’t last for long. You should also remember that puppies on their teething phase are more aggressive chewers due to the associated pain and inflammation in their oral cavities. If your puppy is a young heavy chewer, it’d be ideal to get a chew toy that’s made of either rubber or nylon. Destroyer – as the name implies, dogs who belong to this category are bent on destroying everything they can get their mouths on. However, they may or may not swallow everything they destroy, hence you have to be careful as there can be an overlap between a dog who is a destroyer and one who is an inhaler. Inhaler – this refers to dogs who tend to bite off huge chunks of edible chews then swallow those chunks as quickly as possible. They’re also coined as “gulpers”. Nibbler – a nibbler is a peace-loving dog personality. Dogs in this category are the complete opposite of a destroyer and are technically lovers, not fighters. Hence, they take their time savoring and chewing their toys while also taking care of them as opposed to a destroyer. It can be sometimes tricky to get your puppy to chew on his new toy. This is why you have to consider the flavor when choosing one. It’s a good idea to pick a chew toy which has a flavor that your puppy will surely love. This way, he won’t have a hard time getting used to his new toy. You should also think of your pup’s breed. Pups that belong to giant breeds can already reach the full-grown adult size comparable to a dog of a small breed. Although they are still a few months old, the size of their mouth can already be big enough. Therefore, it’s best to pick a chew toy that can match the breed of your little pal. As mentioned earlier, it won’t be long before your chew toy will get destroyed due to your puppy’s chewing power and behavior. Therefore, choosing a product that is made of durable materials is important. This will keep it from breaking into tiny parts which can pose a serious threat to your pet, especially when these parts get into his digestive tract. You want to pick a chew toy that’s tough enough to allow it to last despite your puppy’s aggressive chewing behavior. However, you should also consider choosing one that’s soft enough for him to chew on. In other words, you should pick a chew toy that has a good balance between softness and toughness. Make sure it’s neither too soft nor too tough. Toys with BPA – BPA is a toxic chemical which can be found in cheap dog toys. Studies have already confirmed its hazards even in very little quantities. Make sure you avoid toys with this chemical at all costs. Inappropriately sized toys – you need to pick the right sized toy for your pups. Don’t pick toys that are too small for your dog. You don’t want your puppy to swallow those toys as it can only lead to choking hazards. As a rule of thumb, make sure you pick one that is big enough that it can’t fit whole in your puppy’s mouth but not too big so the puppy can’t play with it. Toys containing too many parts – although toys that contain moving parts are rare, they need to be avoided at all costs as they can lead to a choking hazard if your puppy ends up swallowing those parts. Children’s toys – while you might be tempted to purchase a children’s toy for your puppy as it costs less, you should avoid doing so. Puppy’s chew toys are made using different standards. They are meant to be safely chewed, while children’s toys are not! Cheap toys that have squeakers – although squeaky toys aren’t dangerous, cheap ones can be, especially for your puppy. As they can be easily torn apart, your pet may eat the squeaker which can be quite dangerous. Cooked real bones – cooked bones can easily break into small pieces that can damage the inner lining of your puppy’s digestive tract over time. Toys with sharp metal parts – needless to say, your puppy may end up swallowing these parts, causing major damage to his digestive tract. KONG is no doubt one of the leading brands when it comes to making toys. One of their best-selling chew toys for dogs are these gourd-shaped toys. Aside from being an appropriately sized for puppies, they also feature an open center where you can place some treats. They can also take on a heavy chewing and even withstand the most powerful bites a puppy can muster. The material used is rubber, making them capable of withstanding years of abuse. Albeit not completely indestructible, rest assured they are a safe and durable option for your little friends. 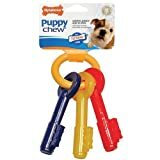 If you’re looking for a tough yet soft chew toy for your puppy, we recommend this key ring from Nylabone. It comes with raised bristles which are useful for cleaning your puppy’s teeth while preventing the buildup of tartar at the same time. 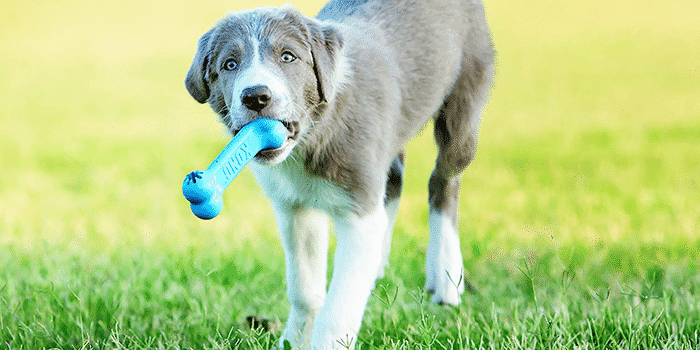 Due to its soft construction, it’s ideal for puppies who are not heavy chewers. However, as your puppy grows older and reaches the teething stage, you might want to replace it with a harder one. Regardless, when it comes to soft chew toys, this one is surely an excellent pick! Aside from this toy’s wishbone design, which is a good-looking treat for most dogs, the Benebone chew toy also comes with real flavors in it. It’s no wonder why it’s one of the most popular chew toys on the market. As it’s made of nylon, you can expect it to last for a long time. Additionally, it comes in three different flavors for your puppy to enjoy: bacon, chicken, and peanut butter. Lastly, while its texture might feel like rawhide, it’s actually way stronger than that. Albeit edible, this teething ring sure has proven itself to be tough and long-lasting enough. 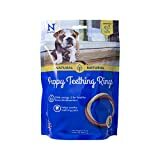 However, unlike the other products on this list, this one’s digestible and packed with extra calcium that will help your puppy during his teething phase. Needless to say, the rings won’t last for long as your puppy will end up swallowing them. It’s available in chicken flavor, although you can find a pumpkin variant as well. 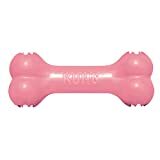 Another quality product from Kong, this one comes in a bone-shaped design for your puppy to enjoy. Due to its shape, your puppy can grip it easily, allowing him to really go down on chewing compared to other toys which can be hard for puppies to properly get a grip on. However, just like most of Kong’s toys, the most prominent feature of this goodie bone is the fact that you can stuff some tasty treats inside for your puppy to enjoy. Another quality chew toy from Nylabone, this X-shaped chewable is designed for puppies weighing up to 15 pounds. It’s designed to withstand destructive chewing due to its durable construction. It also comes with a beef flavor, making it irresistibly delicious for your little friend. Quality is surely one thing you have to consider when going for a rope toy for your puppy to chew on. After all, you don’t want fibers coming off in his mouth. Fortunately, that’s exactly what this rope tug from Mammoth Flossy Chews is. The rope is made of a high-quality material, making it durable and almost impossible for your little friend to destroy. The best part is, it also flosses the teeth of your puppy while chewing on it. As a result, his gums and teeth will stay healthy. For a cooling effect, you can also choose to soak it in water then freeze overnight. Also from Nylabone, this dinosaur-shaped chew toy is the perfect toy for your pet. With its unique and fun design, you can surely have a more enjoyable way to deal with your puppy’s chewing behavior. One of the best parts about this toy is that it comes in chicken flavor, making it a really tempting chew toy for your pet. Aside from that, it comes with nubs which act as bristles for cleaning bacteria and plaque on your puppy’s teeth. 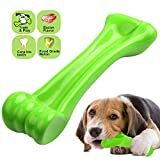 If you fancy giving a neon green toy for your puppy, then this chew toy from oneisall is all you need. Although it doesn’t look like it, it’s actually durable considering that it’s made using a heavy-duty nylon. Aside from that, it is safe for your pet to use as it contains no toxic chemicals. Unfortunately, there are no nubs which can act as bristles for cleaning your pup’s teeth. Regardless, it’s a really great toy that can provide your puppy hours of chewing fun. Q: When to start giving chew toys to a puppy? A: Ideally, you want to give your puppy a chew toy once he starts teething. During this period, he’ll develop a strong urge to chew on almost anything. This is natural, but giving your pet a fun toy can keep him from chewing on your valuables. This way, you can give him a relief while keeping it fun and enjoyable at the same time. Q: Are chew toys safe? A: Generally, chew toys are safe considering that they are intended for chewing purposes. However, not all of them are. Some chew toys on the market contain toxic chemicals which can be hazardous to your pet’s health. There are also some that have many tiny parts which can pose a choking hazard if they get swallowed by your puppy. Needless to say, they are the ones you want to avoid. Q: How do I keep the puppy interested in chew toys? A: In some cases, your puppy will get bored of his toy, prompting him to look for another stuff to chew on. Fortunately, this can be circumvented with the help of a few methods. One involves using interactive dog toys that are designed to keep dogs entertained. A good example is puzzle toys which can be stuffed with a treat. Another is to store the toy on the freezer, making it a cold toy for your pet to chew on. This actually helps relieve pain from inflammation brought on by teething. Puppies normally have a hard time when they undergo the teething process. However, it doesn’t have to happen to your valuables as well. 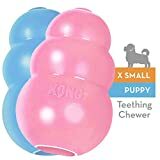 By picking the best chew toys for puppies, you can keep your little friend from ruining your stuff while keeping him entertained at the same time.